St. John’s Cathedral was designed by the English architect Thomas Hardwick and its foundation stone was laid in May 1856. By March 1859, the building had been roofed and the adminstrator, Fr. Burke was privileged to celebrate the first mass in the new cathedral. The Limerick firm of Messrs. Hennessey was commissioned to design the tower and it was completed in 1882. The cathedral was officially consecrated by Most Rev. Edward Thomas O’ Dwyer in June 1894. Three major programmes of reconstruction have taken place, one in the 1950’s and the second beginning in 1977. The third major restoration of the cathedral was completed by Dr. Donal Murray in June 2003 and took two years. The cathedra or bishop's chair and the stalls were carved in Munich in 1894. The cathedra was placed in the centre of the apse, framed by the reredos of the high altar. The finely carved back and canopy of the cathedra is now situated in the cathedral's north transept, housing the oils used in the sacraments of baptism, confirmation and the anointing of the sick and blessed during the mass of chrism on Holy Thursday. The table itself is of Limerick marble, and the substructure of alabaster and coloured marble, adorned in the centre by a group, carved in pure white alabaster, depicting the sacrifice of Abraham. Six bishops lie buried in the cathedral; Bishop Ryan and Bishop O’Dwyer in the main aisle, before the high altar; Bishop Butler and Bishop Hallinan between the main aisle and the south door; and Bishop Keane and Bishop Newman in front of the reserved Blessed Sacrament, in the cathedral's north transept. The tower was designed in1878 to stand at 308 feet, on a base with walls that are some four feet thick. The spirelettes which stand guard at the top of the tower and at the base of the spire are themselves thirty feet high. The limestone for the tower was quarried at Rosbrien. The tower is the tallest in the country and from each approach to the city of Limerick, the spire presents itself, standing out against the horizon or nestling against the backdrop of the Clare hills. Floodlighting was installed in 1986 and replaced during the restoration in 2003, bringing a new visual dimension to the city by night. Internally, St. John’s Cathedral is quite dark. This arises from the particular form of the building, where the two side aisles have steeply pitched roofs rather than the more conventional monopitch (or lean-to) roof. The result is a low level of natural illumination through the high level clerestory windows. In order to overcome this, the pendant light fittings, which were designed and installed in the 1950’s, were fitted with new uplighter and downlighter low-energy bulbs. The effect is to provide a comfortable level of illumination downwards and, on dark days, to also throw light upwards to the ceiling. St. John's has many attributes and some unique features. These tend to be lost in the overall setting of a large building but, through lighting and the use of colour, many of the features have now been highlighted. The calvary overhead is a striking feature. It is illuminated, with a bias from one side, so as to highlight the features and, with the cathedral on a low light setting, it is quite dramatic. In the transept a similar pattern has been followed. The baptistry has been returned to its original location as indicated by the plaque commemorating Bishop O’ Dwyer. The cathedra's former reredos has also been moved to the north transept and refashioned as an aumbry for the Holy Oils. These are individually illuminated, creating a special atmosphere, particularly for the celebration of the sacrament of baptism In the south transept, the painting of the Pieta, attributed to Collopy, is highlighted by high level lights. 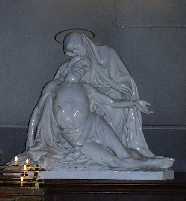 The statue of Our Lady by the Italian Giovanno Benzoni is illuminated in similar fashion. On the centre left light are John the Baptist, to whom the cathedral is dedicated and below him the patron saints of the diocese, St. Munchin and St. Ita. The centre right light has St. Joseph at the top and the patron saints of Ireland, St. Patrick and St. Brigid. The outside left light has figures of St. George, name-saint of Bishop Butler, who erected the window, and St. Senan. St. Colman and St. Vincent de Paul occupy the outside right light. 'The southern transept window is a five light lancet window. Erected, as were the other windows of the transept and the aisles, by Mr and Mrs Thomas E. O’ Brien of Southill in 1881, 1882 and 1887 as a memorial to their friend, Bishop George Butler (1861-86), it has the Assumption of Our Lady as its main theme. This window depicts the mysteries of the rosary woven around the figure of Our Lady. The base line of figures represents the joyful mysteries of the rosary; the annunciation, the visitation, the nativity, the presentation and the finding of Jesus in the Temple. Two of the sorrowful mysteries are represented on the next level, the agony in the garden and the scourging at the pillar. The crucifixion and the meeting of Jesus and his mother on the Via Dolorosa occupy the level above this, leading to the glorious mysteries at the uppermost level. Here the two scenes lift the mind towards the sun. The northern transept window, being parallel to the southern one, is also a five-light lancet window. The transfiguration of Christ forms the central theme of this window, with Moses and Elias beside him and Peter, James and John at his feet. Scenes from the life of Christ fill the remainder of the window and they include, at the lowest level, the temptation of Christ, the wedding at Cana, the miracle of the fish, the raising of the daughter of Jairus and the raising of Lazarus. The calming of the seas and the sermon on the Mount complete the little children on the centre right light. The centre light has Christ and St. Peter, while the outside left light has Christ with the centurion and Christ teaching his disciples.' The colour scheme of the cathedral picks up some of the dominant colours in the stained glass and when the sun shines, particularly on the east window and on the south transept, the light is quite dramatic. The lighting system has been used to illuminate the windows from inside and enable them to be viewed at any time. Use of internal window lighting also creates a reverse effect such that the windows can be seen outside the cathedral: the light emanating from the windows is symbolic of the light and hope which the cathedral offers to those who come to it. The objective has been to personalise the cathedral, to create individual spaces with colour and warmth and light, and to give to people a sense of space and areas with which they can identify and practice devotion. The organ dates from around 1900 and was built by the firm William Hill. It is made up of three manuals and pedals with forty four stops. In recent times a new rewiring and replacement of the electrical system was done by Stephen Adams, Organ Builder. The sanctuary floor, immediately surrounding the high altar, is laid out in the form of a labyrinth, as in some mediaeval cathedrals. In the Christian tradition, a labyrinth represents the path of Christian life: this path was walked at significant times, such as on the eve of baptism or confirmation, or during Holy Week. This particular design, based on a design by Michelangelo, is at once a continuous line and has the appearance of being a twelve pointed figure. The central symbolism is of Christ at the altar of sacrifice surrounded by the twelve apostles, represented by the twelve points. The materials -supplied by Irish Natural Stone of Boston, Co. Clare - are Irish limestone, polished to appear darker and Italian white marble. The purpose of the baldachino is to highlight the significance of the reserved Blessed Sacrament. This baldachino is a tent-like structure, a canopy reaching up and over the tabernacle. It is constructed of lamellae of onyx with a pair of timber and steel masts supporting the awning to the front. Funcioni Marble of Santa Pietra in Tuscany supplied the onyx while OMC of Limerick supplied the stainless steel structure and erecting stones. The masts were supplied by Cedarlan of Cork.